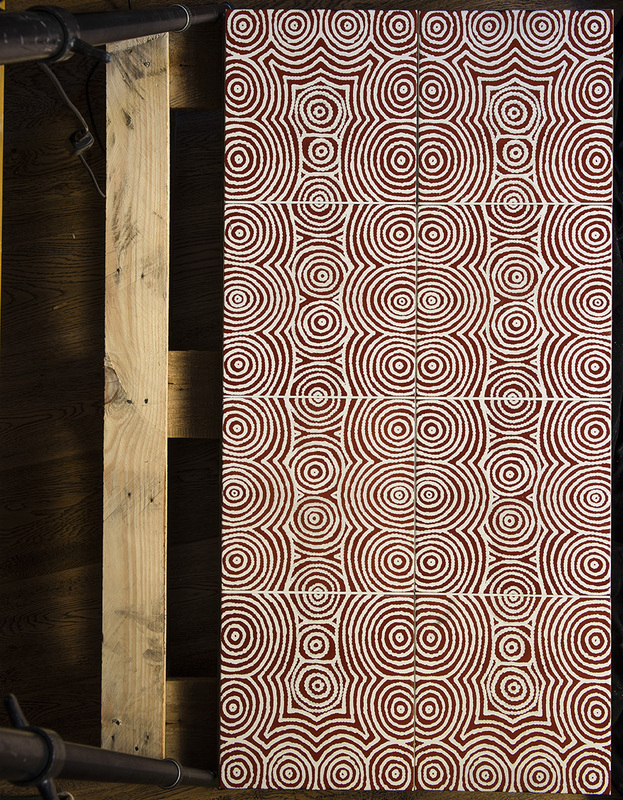 Detail of our award winning Bush Onion 1 ceramic wall tile, from an original Australian Aboriginal painting. The use of Ceramic Tiles in homes and architecture is as ancient as universal and diverse, which is why this April 2017 saw the launch of Britain's first National Tile Week– "a celebration of tiles, aiming to educate consumers on the quality and versatility of tiles and how they can be used throughout the home." Our award-winning My Country Aboriginal Art Ceramic Wall Tiles are testament to the expertise of the British Ceramic Tile industry, as it is thanks to our collaboration with Johnson Tiles that we were able to successfully reproduce the intricate detailing and vibrant character of this Art for the very first time in design history. Our award-winning Emu Dreaming ceramic wall tile from an original Australian Aboriginal painting, samples of which are kept in the Material Lab tile library for public consultation. We turned to Johnson Tiles after hearing about their specialist Artile service through the British Museum. Using state of the art techniques, Artile painstakingly reproduces any illustration, drawing or picture onto a tile with no loss of detail or colour. The quality of the reproduction was especially crucial to this enterprise, given that in Australian Aboriginal Art every dot, line, abstract & figurative representation and choice of colour has special meaning and spiritual importance to the Aboriginal people. This interior collection provides a window into a world that many have still not yet had the privilege to see or encounter. Johnson Tile were a delight to work with, taking on the challenge with dedication, enthusiasm and sensitivity for the nature of our commission — "we weren’t just recapturing an image but a culture, a history, and all of its folklore and traditions. Implementing traditional lithography techniques combined with our state of the art technology and high-res scanning process, we were able to accurately match every detail and colour of Sarah and Geraldine’s paintings." The original paintings by the contemporary Australian Aboriginal artists we represent, which Johnson Tiles so successfully reproduced onto ceramic tiles. Tiles, especially ceramic tiles have as many functional advantages as different styles. The ancient Greeks were prolific tile users, designing tile motifs inspired by abstracted natural forms, developing stylistic standards that still today serve as reference points. Tiles are foremost durable: tough, water-resistant, heat-reflective and help regulate ambient temperature. Decoratively, the breadth and width of contemporary tile designs make it one of the greatest creative assets in interiors. Our award-winning Bush Onion 1 ceramic wall tile as a kitchen splash back, adding a subtle element of ochre red & geometry to the clean lines of this contemporary minimalist kitchen design, creating a space with a unique elegance and simplicity. Ceramic tiles are hardy, easy to install and need very little upkeep. They’re also available in a wide range of sizes, prints and finishes, making them a good value, versatile option." Her top-tips blog is a great practical guide if you are thinking of shopping for tiles. Our Emu Dreaming ceramic tile was the inspiration for this beautiful Cedar of Lebanon coffee table design by The Fine Wooden Article Company, a Gloucestershire-based designer maker workshop that source all their wood sustainably, and wherever possible locally. Our award-winning My Country Australian Aboriginal ceramic wall tile collection is available for sale through our website and is also stocked by national suppliers & showrooms such as Eporta.com, Kew Stone & Tiles Etc. and available to consult in Material Lab's showroom library. Our award-winning My Country collection of ceramic wall tiles, translations from original paintings by the Australian Aboriginal artists of the Central Desert that we represent in the UK.